Receive 10% off when you purchase 2 or more kits! The equine hair tissue analysis includes a comprehensive interpretation of the mineral assay performed by a federally licensed laboratory (Trace Elements, Inc.). 15 nutritional elements are measured, 8 toxic metals, 7 significant mineral ratios, 9 toxic ratios, and an additional 15 elements. 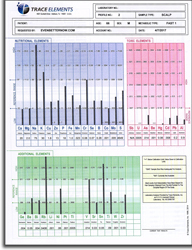 You receive a printed bound copy and an electronic email copy of the test results which show graphic illustrations of the levels and ratios. 8 Toxic Heavy Metal Elements: Antimony, uranium, arsenic, beryllium, mercury, cadmium, lead and aluminum. These heavy metals are well-known for their interference upon normal biochemical function and causing numerous imbalances. Also includes 15 Additional Elements including: Germanium, barium, bismuth, rubidium, lithium, nickel, platinum, thallium, iodine, vanadium, strontium, tin, titanium, tungsten and zirconium. All mineral/metal levels are reported in milligrams percent (milligrams per one-hundred grams of hair). One milligram percent (mg%) is equal to ten parts per million (ppm). 6 Significant Mineral Ratios: Ca/P, Na/K, Ca/K, Zn/Cu, Na/Mg, Ca/Mg, Fe/Cu. If the relationship between certain minerals in the horse are disturbed, normal biological functions and metabolic activity can be adversely affected. 9 Toxic Mineral/Metal Ratios: Ca/Pb, Fe/Pb, Fe/Hg, Se/Hg, Zn/Cd, An/Hg, S/Hg, S/Cd, S/Pb. Research has shown that toxic minerals/metals can also produce an antagonistic effect on various essential minerals, leading to disturbances in their metabolic utilization. An individualized evaluation and discussion of mineral patterns and their impact on chemistry and performance are written out. Tissue mineral levels related to feed and water mineral content are also discussed. Dietary supplement recommendations (by Trace Elements, Inc.) are given based solely upon hair mineral patterns determined. Please Note: If you require further interpretation of the results, we can refer you to an equine hair analysis expert, who will offer consultations at a rate of $15/quarter hour. The kit includes a lab submittal form with envelope, and complete instructions on how to take the hair sample. You then send the hair sample to the lab, and the lab sends us a printed bound copy which we then ship via USPS First Class Mail to you. (Reports for international customers are mailed via First Class Mail International). If you opt for the printed and email copy when ordering, your electronic copy will be forwarded to you in advance of receiving the printed copy. Also Note: Please include the name of your horse in the "Additional Information" box when placing your order or contact us to let us know. This is to ensure that we can match your order and mailing address to the name on the report.